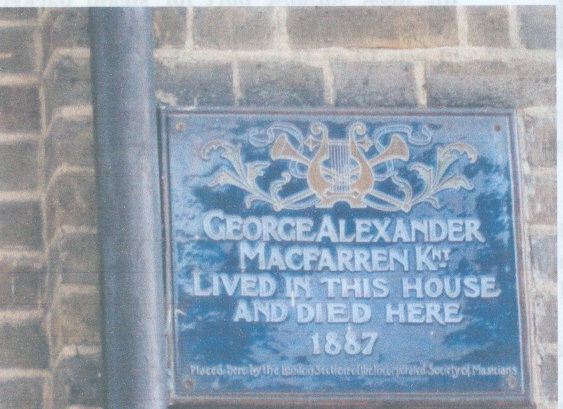 Westminster launched its own series of Green Plaques in 1991, distinctive from the English Heritage Blue plaques. Where the original building has been demolished, a plaque may be placed on the new building on the site. People who are regarded as eminent by most members of their profession, or have genuinely contributed to human welfare or happiness and deserve recognition when sufficient time has lapsed since their life to show their lasting contribution to society are considered. 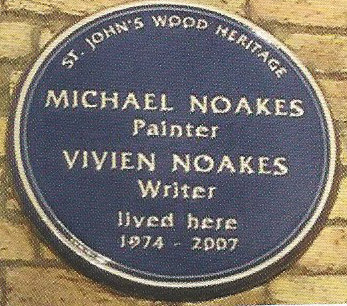 Michael Noakes is a portrait painter who has been President of the Royal Institute of Oil Painters,and chairman of the Contemporary Portrait Society. He won a platinum disc for his sleeve design for the record Portrait of Sinatra, the only painter ever so honoured. Vivien Noakes was a biographer, whose writings included a biography of Edward Lear, an editor and critic; she also wrote a survey of literature of the First World War. Together they wrote the Daily Life of the Queen, an artist’s diary of a year with the Queen. 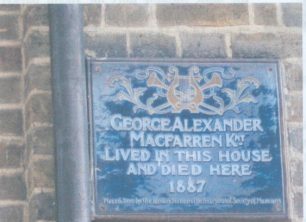 Macfarren was the son of a dancing master and author who suffered all his life from poor sight and had to have an amanuensis. He was Principal of the Royal Academy of Music, Professor at Cambridge, conductor at Covent Garden, programme-note writer for the Philharmonic Society and editor of Handel and Purcell. He wrote eighteen operas, thirteen oratorios and cantatas, nine symphonies and one hundred and sixty two songs despite going blind in 1860. He married Natalia 1827-1916 who was born in Lubeck but studied at the Royal Academy and was an operatic contralto and composer. Macfarren is one of the most fascinating lost masters of nineteenth century British music. A cultured musician in every sense, he brought formidable energies to bare upon almost all aspects of mid-Victorian musical life, being at various stages Principal of the He was knighted in 1883. As a composer he was technically superior to most of his British contemporaries and, in view of the total blindness which struck him in 1860, extraordinarily productive. An output which included eighteen operas, thirteen oratorios and cantatas, nine symphonies and one hundred and sixty two songs might well be thought impressive by any standards. Britten was a composer, conductor and pianist, and one of the central figures of twentieth century British classical music. He showed his talent from an early age, composing prolifically as a child. He collaborated with the poet W.H. Auden on several compositions, including Hymn to St Cecilia, and Britten and his partner Peter Pears, the tenor, followed Auden to America, spending the early years of the war there. 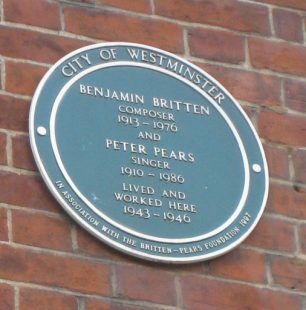 While in America, Britten wrote his first music drama. Paul Bunyan, an operetta to a libretto by Auden, and the American period was also remarkable for a number of orchestral works, including the Violin Concerto Op. 15 and Sinfonia da Requiem Op. 20 for full orchestra. In 1940 he composed Seven Sonnets of Michelangelo Op 22 which was premiered at the Wigmore Hall in September 1942. Britten and Pears had returned to England in spring 1942, Britten completing Hymn to St Cecilia and a Ceremony of Carols Op 28 while crossing the Atlantic on board MS Axel Johnson. On arriving in England Britten and Pears both aplied for recognition as conscientious objectors. This was granted on condition they gave recitals under the auspices of the Council for the Engcouragement of Music and the Arts. From 1943 until 1947 they lived at 45A St John’s Wood High Street, where visitors to the flat included Erwin Stein and his daughter Marion, (later the Countess of Harewood and Mrs Jeremy Thorpe) who took refuge there after their flat was ruined by a fire. Britten began work on his great opera Peter Grimes, which was premiered at Sadlers Wells in 1945. 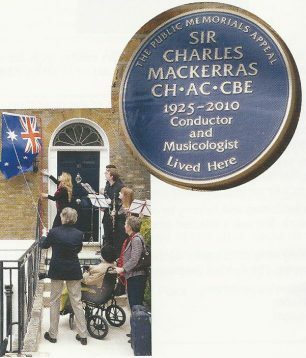 Sir Charles was the first Australian conductor to be chief conductor of the Sydney Symphony Orchestra and had a long association with the English Nation Opera and Welsh National Opera.. He arrived in England in 1947 and worked as oboist and cor anglais player at Sadlers Wells Theatre before studying conducting in Prague, where he came under the spell of Janacek’s operas. In 19959 he was a landmark recording of Handel’s music for the Royal Fireworks using original wind band instrumentation. He was an authority on the operas of Janacek and Mozart, and the comic operas of Gilbert and Sullivan. 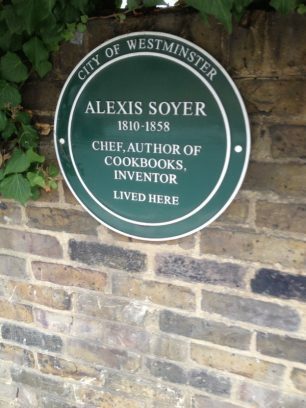 A French chef, Soyer became the most celebrated cook in England. Escaping from France during the 1830 Revolution, he worked for the Duke of Cambridge’s household where his brother was head chef. From 1837 – 1850 he was chef at the Reform Club, and designed the innovative kitchens there, which became so famous that they were open for conducted tours by the public. He managed to feed 2000 members and their guests on the occasion of Queen Victoria’s Coronation. During the Irish famine he ran free soup kitchens in Dublin to help the starving poor and then during the Crimean War he joined the troops – originally at his own expense – to improve the feeding of the army. 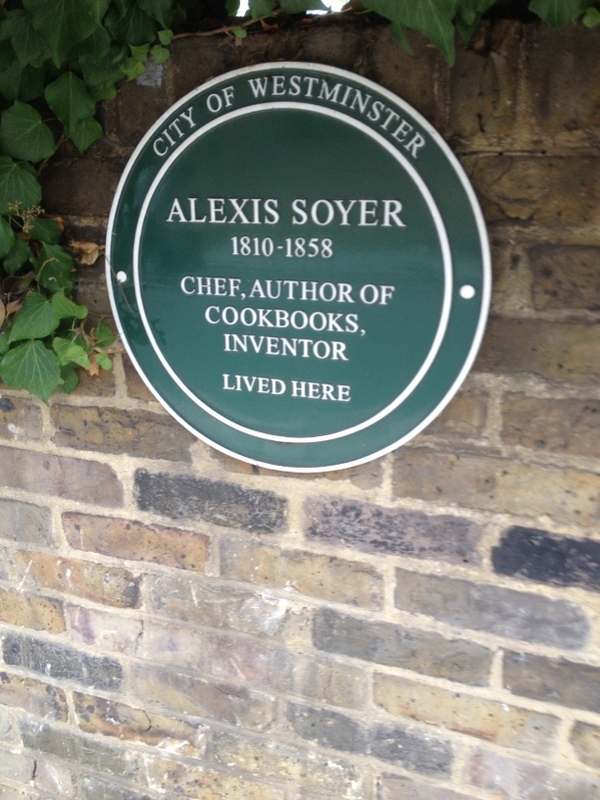 He trained regimental cooks for every regiment and invented the Soyer stove which is still used by British soldiers. Joseph Hertz was a Hungarian born Rabbi and Bible scholar, who emigrated to New York in 1874 and in 1898 became Professor of Philosophy at Transvaal University, South Africa. In 1913 he became chief Rabbi of the United Hebrew Congregations of the British Empire, his oratory, erudition and sincerity earned him the respect of the majority of British Jews and this memorial plaque was unveiled in 1998. Edward Elgar was the classical composer who first took the gramophone seriously, using acoustic recording from 1914 – 1925 and then adapting to the microphone and realising its possibilities. On the wall of Abbey Studios is a plaque from Westminster City Council saying Sir Edward Elgar opened and recorded in these studios 12 November 1931. There is a film on YouTube showing him with the BBC Symphony Orchestra, conducting his Pomp and Circumstance March (Land of Hope and Glory). He begins by saying Good morning, Gentlemen. Good to see you all. Very light programme this morning. Please play this tune as though you’ve never heard it before. In June 1932, he recorded his Violin Concerto there with the young Yehudi Menuhin, a recording which has remained in print on 78 rpm, LP and CD ever since. Billy Fury (born Ronald Wycherley) was an English singer and song writer and early rock-and-roll star, who had 24 hits in the 1960s. Philip Jones was born in Bath on 12 March 1928 into a line of brass players, beginning by playing the bugle as a sea cadet at the age of nine before moving on to the trumpet and cornet two years later. In 1951, he set up the Philip Jones Brass Ensemble (PJBE), initially just a quartet of players from the Royal Opera House Orchestra, with his uncle playing second trumpet. 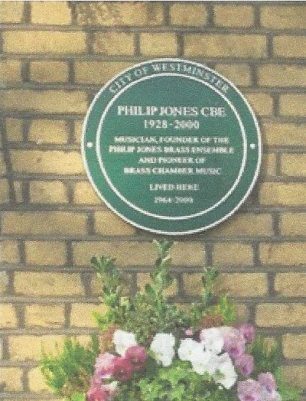 During the 1950s and 60s whilst building on the success of the PJBE, Philip Jones occupied the principal trumpet seat of several first class orchestras, including the Royal Philharmonic Orchestra (1956-60), the Philharmonia (1960-64), the New Philharmonia (1965-7) and the BBC Symphony Orchestra (1960-71). By the 1970s they were a 10-piece ensemble of 4 trumpets, horn, 4 trombones and a tuba, and they were touring all over the world. Philip Jones was Director of the School of Wind and Percussion at the Royal College of Music in Manchester (1975-1977) and at the Guildhall School of Music and Drama in London from 1983 -88 and then Principal of Trinity College of Music.